Project Compassion supports initiatives in many countries throughout the world. This week the focus is Australia. 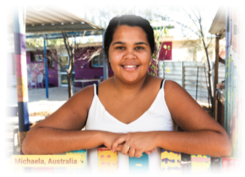 An example of the help provided through Project Compassion is Michaela, who is a 21-year-old trainee at Purple House, which is a dialysis centre in the Central Desert for people suffering from kidney disease. With the support of Project Compassion, Michaela is helping to build a social enterprise, a connection to culture and a new outlook for the chronically ill.
Next week the focus is in Bangladesh where Project Compassion support has been provided to train midwives who can then help mums to safely give birth to their babies. During Lent some classes children have been donating funds to support projects in both Australia and Bangladesh. Other countries including Vietnam, Zimbabwe and the Solomon Islands have also been a focus for various year levels. The focus of Project Compassion in 2019 is Give Lent 100%. Since choosing a project at the beginning of Lent all classes have been focusing on Giving Lent 100% through their donations to Project Compassion. The children have been very creative in organising various ways that they could raise money for their class project. Families have also been very generous in their contributions and there is still a week to go! We have included some information about Project Compassion from each class and some of their innovative and creative ideas! In Pre-Kindy our goal was to raise funds to provide two reliable water taps ($5.00 per water tap) in the Solomon Islands. We have raised enough funds to provide the two water taps. In Kindy, our goal was to raise $150.00 ($75.00 from KB & $75.00 from KW) We have raised $265.65 and exceeded our goal!!!! This money will now provide mentoring and skill building programs for a community in Indonesia, giving them income generating skills in eco-tourism, and enabling them to maintain important cultural links to their land and the forest. In Pre-Primary our goal was to raise $40.00 per class to provide six water taps and five metres of guttering to collect valuable rainwater for the people in the Solomon Islands. We have managed to raise that much, plus more! We are now able to provide fifteen metres of guttering and sixteen water taps to the Solomon Islands as we have worked hard and raised $234.00!!! In Year One our goal was to raise funds to assist rural midwives in Bangladesh to visit mums-to be, for a vital pregnancy check-up in their own homes. Just $1.00 will provide enough funds for one midwife to visit a mum-to- be! So far we have raised $137.00 in Year One Blue and $106.00 in Year One White which means we could now provide help, through a visit from a midwife, for 243 Mums-to-be in rural Bangladesh. In Year Two we have been busy fundraising for Project Compassion. At home we have been fasting from things we like and using the money we would have spent on that item to donate to Project Compassion. We have also been raising money by doing chores. With our donations so far we have been able to provide two Vietnamese children the opportunity to attend group learning activities with other children living with disabilities. 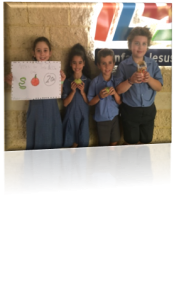 We also picked the apples from the school apple trees and sold apple slinkies at recess to raise money. With this money we are able to provide a school in the Solomon Islands with 50 metres of guttering so that they can collect rainwater. We also raised enough to provide a midwife for a new mother in Bangladesh. The total so far is $152.80 from Year Two Blue, $150.75 from Year Two White and $50.95 from the apple slinkies!! 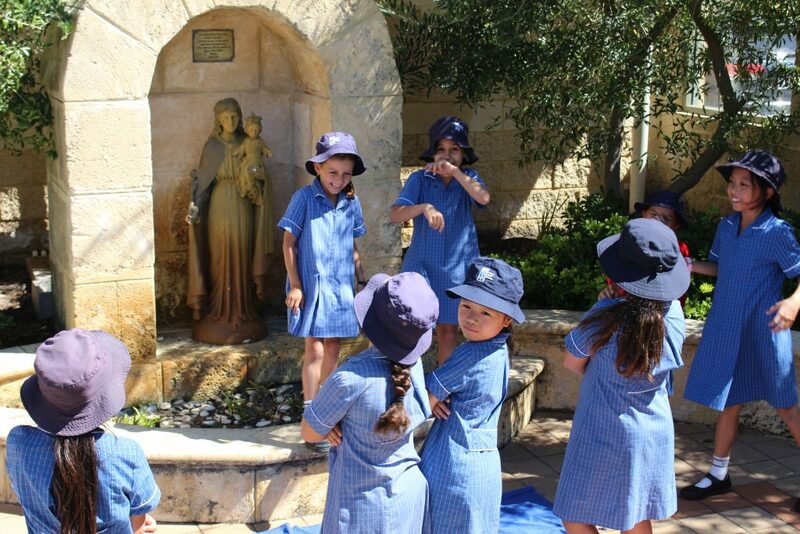 During Religion the Year Three students have been discussing the meaning of Christian Service. To raise money for Project Compassion the students were encouraged to do an act of Christian Service such as helping out their parents at home to raise money for our 2019 goal. They have also been collecting and donating their pocket money. With our generous donations we have raised $137.00 which will provide three students in Zimbabwe with school supplies. Year Four Blue has been working hard to provide different cultures with money to help Project Compassion. So far, we have provided eight water taps in the Solomon Islands, three check-ups for pregnant ladies in Bangladesh, one person to go and strengthen cultural bonds in a community in Australia and provided a funds for a child with disability to attend learning activities in Vietnam. We are $18.00 away from providing a school with five meters of guttering to collect valuable rainwater in the Solomon Islands. We are looking forward to seeing what our total will be at the end of term! Year Four White has collected $109.00, which is more then enough money to buy educational school supplies for a student in Zimbabwe who is studying to be a nurse. We have also raised enough to help provide a school in the Solomon Islands with five metres of guttering which provides them with valuable clean water. Year Four White has raised money by doing chores, collecting birthday money and donating their saved up money. We are hoping to raise more money to continue helping others! With our generous donations of $165.00 in Year Five White and $271.00 from Year Five Blue the initial training course for a rural midwife can be provided. This will then help mums in Bangladesh to safely give birth to their babies. To raise this money, the Year Five children have been completing tasks at home, donating their pocket money and participating in reflections on the Project Compassion stories. They are very proud of their efforts and the change they are making in the world. With the generous donations from Year Six Blue we are able to support First Australians with traditional local foods for a community bush picnic. This will help in strengthening cultural bonds to the community and the country. With further donations, we will be able to support a child in Vietnam who has learning disabilities to attend group learning activities. Each week we have viewed the Project Compassion clips online and discussed the differences in lifestyle between the people featured and ourselves. We truly understand how very fortunate we are in our lives and are grateful to our families for being in the position to provide wonderful things for us. The children in Year Six White are working hard and bringing in coins to add to their Project Compassion boxes. They have been doing chores at home and using their pocket money to help us reach our goal. We were aiming to raise $150.00 to assist children in Vietnam to attend group learning activities with other children living with disabilities. Currently, we have reached our goal and have raised over $180.00, with still more money coming in each day! We thank all families for their support and generous donations to support Project Compassion in 2019. Easter celebrates Christ’s death and resurrection; an act of pure love that offers us endless hope and continual joy. The Catholic Community of Morley invites you to join our 2019 Easter celebrations.